I got this block finished up last night. I'm really happy with how it turned out! 40 ct. Meadow Rue, various cotton over-dyed threads. I decided to start something new today! It's the Birds of a Feather mystery sampler by With Thy Needle & Thread. The kids only have one more week of school (three days actually) and then our get together in Manning is next Saturday (can't wait for that)!! The next day we'll be headed down to Florida for a few weeks, so my posting may be sporadic. Write when I can! A prettily finished block! Isn't it fun to start something new! Lookin' good Nicole, nice fabby choice. Love both pieces! The lentil looks really nice for the mystery sampler! Your AotH is really zipping along! 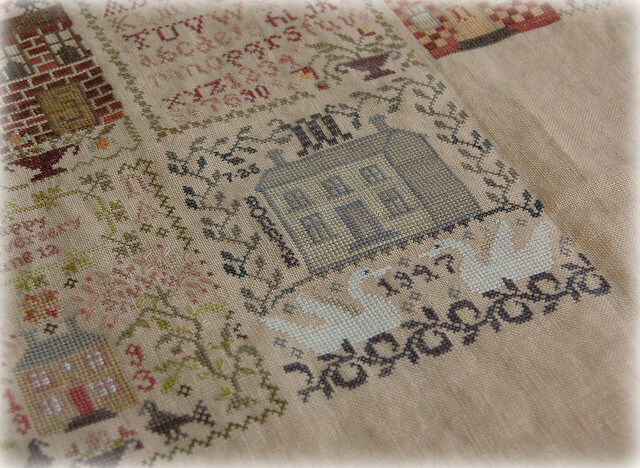 I love the linen you chose for the Mystery Sampler too! love love love AotH! It's looking so beautiful! Very pretty Nicole.... can't wait to see you next Saturday! AOTH is looking good and I like the July block. I like your choice of fabric for the Mystery Sampler. I can't wait to see more. Have fun in FL !! Congrats on the new block! very exciting progress! Nice Job! Thank you for sharing! Oh, so lovely! I started my Mystery on Cafe Aulait, but alas, a miscount and the piece is too small...after frogging last night, starting over on 36 Lentil today. I just love seeing the finished of the AoTH series. Also, love that you got started on the mystery sampler. Lentil looks great! Your finish looks great! I have the mystery sampler as well, but haven't started it yet. I wish things had worked out so that I could have joined you girls on the 4th, but sadly I have to work. :( Enjoy your weekend! Gorgeous finish!!!! 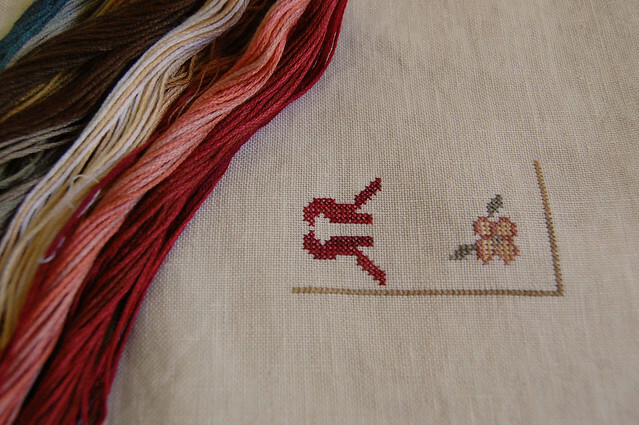 Love your AotH and the mystery sampler is so pretty on the linen. Lovely AotH finish! Glad you got to start your Mystery Sampler, I hope to start mine next week! That's such a pretty block! I think Lentil is a great choice for your mystery sampler. Nice new start! Your Anniversaries of the Heart are simply gorgeous. Love it. Great start on Birds of a Feather. No matter how many times I see AotH, I LOVE it all over again as if I had never seen it. :) Beautiful. Really nice finish on the latest block. The whole piece is looking lovely. Well done on your block finish. Lovely new start, pretty colours.